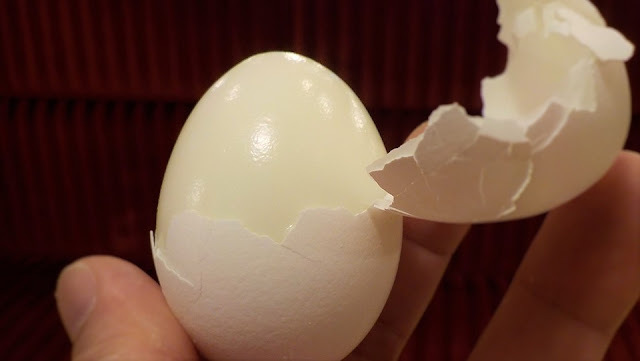 -- Adding baking soda to the water when you are hard boiling eggs - the shell will come right off! Simply add one teaspoon of baking soda to the cooking water to increase the alkalinity - it will make the eggshell easier to peel. NOTE: The only downside is this can make the eggs taste more sulfuric. • Why Are Hard-Boiled Eggs So Hard to Peel? Check out these no peel egg products on Amazon! 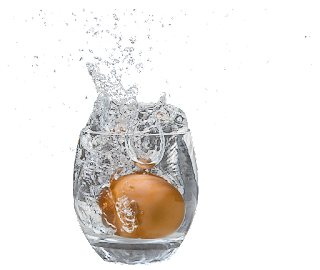 -- A quick shake in a partially water-filled glass can peel your hard-boiled eggs cleanly in a matter of seconds. Shake it over the sink, for spills. Then just reach inside the glass and pinch the egg's shell right off! Check out these in-shell egg scramblers on Amazon!